Sigma has announced 4 new Canon-mount lenses. 2007.3.8: The APO 200-500mm F2.8 EX DG is the world’s first Ultra-Telephoto Zoom Lens that offers a fast aperture of F2.8 at 500mm focal length. It covers the widely used 200 to 500mm focal length range, and maintains its fast F2.8 aperture over the entire zoom range. Four SLD (Special Low Dispersion) glass elements provide excellent correction for all types of aberrations and produce a high level of optical performance throughout the entire zoom range. Shooting distance and focal length can be viewed on the lens' LCD panel, which is an additional convenience for the photographer. Copyright 1999-2007 SIGMA CORPORATION All right reserved. We've seen this one before, but what an awesomely-spec'd lens. It looks like it was made for the military. At 34.6 lbs (15,700g), you're not going to hand-hold this one. It would be nice to see "EX" in that name, but a 4-stop OS is a nice addition to what looks like the Sigma 50-500mm EX Lens. 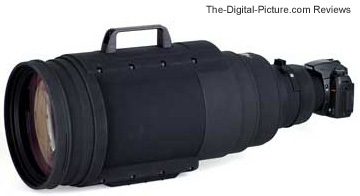 Looks like an updated Sigma 80-400mm EX Lens - without the "EX". HSM is a very welcome improvement in this case. Tamron announces the Tamron SP AF 10-24mm f/3.5-4.5 DI II LD Asperical Lens. No availability date has been given. Update: Sold Out. The CompactFlash deals keep coming - How does Free after rebate sound for a very decent CF Card? Adorama has the Kingston 4GB 133x Elite Pro CompactFlash Card for free after rebate. Download the rebate form on the Adorama product page. Canon EOS 40D ISO 12233 chart sample crops have been added to the site for the Canon EF-S 55-250mm f/4-5.6 Lens. I also shot the 40D tests for the Canon EF 70-200mm f/4L USM Lens (the compare-to lens in the link above). Take another look at the Canon EOS Rebel XSi / 450D Digital SLR Camera Pre-Review for information and product pictures including mouseover comparisons with other Canon cameras. Historically, to get a new piece of Canon gear when it first hits the streets, you need to preorder. However, some items are harder to get than others. My guess is that the Rebel series bodies will hit the shelves in high volumes, making them relatively easy to get within a few weeks of the first deliveries (unlike 1-series bodies). I'm less certain of the new L lens' early availability. They are going to be very highly desired, but carry a very high price which will reduce the demand for them. The Rebel XSi / 450D appears to be a strong upgrade to the Rebel XTi / 400D. The review placeholder page (link above) shows some product pics and provides links to both the Canon USA and Canon Europe press releases - with highlights in bold. Amazon.com is taking preorders. Pre-announced last fall at PhotoPlus Expo, the new 200 is formally announced today. I anticipate this to be an awesome lens in all regards; however, the price will stop all but the serious photographers from making this investment. Once again, the review placeholder page (link above) shows some product pics and provides links to both the Canon USA and Canon Europe press releases - with highlights in bold. Ditto from the 200 ... Pre-announced last fall at PhotoPlus Expo, the new 800 is formally announced today. I anticipate this to be an awesome lens in all regards; however, the extremely high price will stop all but the serious photographers from making this investment. The review placeholder page (link above) shows some product pics and provides links to both the Canon USA and Canon Europe press releases - with highlights in bold. The 800 shares press releases with the 200. Well, not really new. You've seen this one before - actually, many of us have one. This lens is available throughout most of the world. The 55-250 will now become available in the USA. The review placeholder page (link above) shows a product pic and provides links to both the Canon USA (part of the XSI/450D release) and Canon UK press releases. Adorama has a huge number of "Refurbished By Canon" cameras, lenses and flashes in stock - 63 items at this moment. Expect like-new equipment at nicely reduced prices. Sandisk has Winter 2008 rebates valid on purchases through Mar 3, 2008. Some of these rebates amounts are significant and increase if more than 1 of the same card is purchased. To make the deal hot, Adorama is offering a 10% higher rebate if the gift check (redeemable at Adorama only) option is selected AND they are offering great sale prices on these cards. Download the rebate form at one of the following links for the full details. New: Canon Digital Photo Professional Tutorial Site. Canon has updated their current rebate form to indicate the new expiration date (1.7MB PDF). Good news - Canon has extended the lens and flash rebates until February 17th. They have not yet updated the flyer or web site. Canon has made an easy-to-understand Color Management Guide available (2 MB PDF). One last reminder - the Canon lens and flash rebates expire on Sunday the 13th. Stuff for sale ... As before, these offers are available within the cUSA. Please do not ask me about selling anything else as I am probably not and do not have time to keep a waiting list. Sorry! To be fair to everyone, all items will remain for sale until I receive a firm "I'll take it" under agreed-upon conditions. I will accept Paypal if shipping to the verified address. Use the email button at the top and bottom of this page to contact me. Like new in box with all original accessories. Barely used. Sigma focus calibrated this lens for me though it is still not the best-focusing lens I've used. Like new with exception of a little dust AND - the kid's cat decided to attack it (I was trying to think of a better story, but ...). There are 6 or 8 tooth marks into the front of the case on the bottom of the flap. I have a picture available for serious buyers. In excellent condition. A little dust and minor tape residue. Comes with box, manual, padded case, stand. In use since 3/2/2005. In excellent condition. A little dust and minor tape residue. Comes with box (missing UPC), manual (like new), padded case, stand. In use since 12/11/2006. Selling because I have completed my upgrade to 580EX IIs. In excellent shape with padded case and second adaptor. Like new with exception of a little dust. The current Canon rebate programs are coming to a close. The lens (and flash) instant rebates end on January 13th. The $400 Canon 5D + Pixma Pro9000/9500 Rebate and Canon Pixma Pro9000/9500 $100 Rebate end on January 12th. As I said before, the $100 rebate appears to be stackable with the $400 rebate as it requires a "Secondary Proof of Purchase" UPC code. So, if my figuring is correct, you can get the Canon EOS 5D + Pixma Pro9000 kit at Adorama for $1,984.46 after two rebates. If you don't need the printer, EBay it - I sold mine for $355 plus shipping making my 5D net under $1,700. Very nice. Never Forget a Lens Again. Microsoft Professional Photography has relased Microsoft Pro Photo Shoot, a free plugin for Outlook 2003 and 2007. While there ... Those of you interested in shooting sports will find the The Ultimate Setup—Sports Illustrated and the Final Four article interesting. Update: Gone. The Canon 1Ds Mark III is in stock at 17th Street. At least for the moment. Tamron has announced a new round of lens rebates. Act fast! B&H has the Canon EF 1200mm f/5.6L USM Lens in stock! A cool $99k for a "9" condition lens.